Anyone who has painted their nails, ever, will be able to relate to this post. Firstly, there's the colour choosing which take a great deal longer than it probably should because you have to pick just the right shade of maroon that matches your new pumps but that will not clash with that handbag you're taking to dinner on Saturday night. Next, comes the painting. There are three types of painters: the perfectionist, the realist and the negligent. 1) The perfectionist seeks to focus all of one's attention on the nails and will not rest until each and every one has had the same time to achieve painstaking perfecting in two coats. 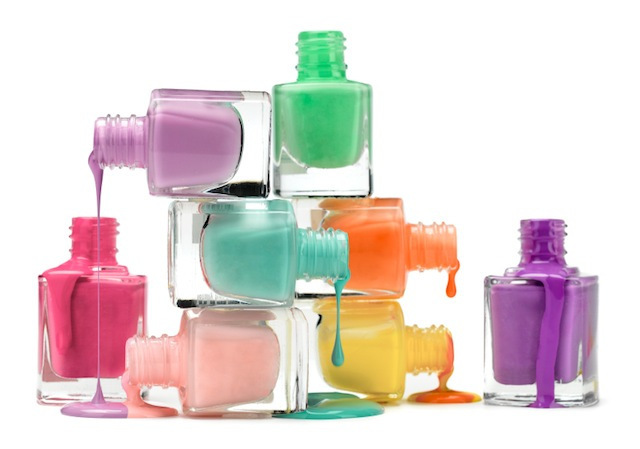 The perfectionist will very rarely use multiple colours and often substitutes with fancy top coats instead. They may be seen waddling about the house with foam between their toes to protect against 'smudgies'. 2) The realist, they've got 5 spare minutes before they run out of the door, they reach in, choose a colour - yep, it'll do - and begin swiftly painting a large stripe down the centre of the nail, missing only the tiniest of spaces around the edge (a space that would drive any perfectionist mad). After a quick blow their out the door and ready to go, who cares if the tiniest of chips can now be seen thanks to a tangle with the house keys? 3) The negligent. Their work may only be described as that which a 3 year old would be proud of. Not only do they paint the nail, but at least 1/3 of the surrounding skin too, prompting them to look like they have been helping out with finger painting at the local pre-school, with the colours to match. Then comes the chipping, sending the perfectionist to the polish first for minor touch ups, and then straight to the remover less than a 2 days later. The realist notices the chips but believes that they can rock the grungey style for just a little longer before it goes out of fashion. Whilst the negligent neglects both polish and remover and settles for the option to allow the polish to remove (or walk off!) itself, before replacing. What type of nailist are you? What's your favorite type of polish?